To receive a bi-weekly email of updates on this book and project, please contact us at HumanityAtStake@gmail.com, with subject line, "HAS listserve". Or, if you have an upcoming event in mind that might be appropriate for this project, please email us with subject line, "HAS events". We welcome you to get involved, and thank you for your support! Event description: "Ever try explaining Taiwan-China cross-strait relations to a non-Taiwanese or non-Asian friend? How about discussing it with friends from mainland China? Ever wish for an opportunity to discuss such issues with your friends of different backgrounds? 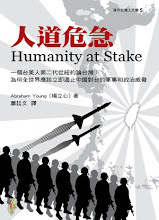 Abraham Young, author and NATMA2G member, recounts one such experience in his new book, Humanity at Stake. During our November Wine Tasting event, you will have an opportunity to hear him read excerpts from his book and to participate in an informal discussion regarding cross-strait relations. We encourage our members to bring at least one friend who would like to learn more about Taiwan-China cross-strait relations. In addition, guests with potentially contrasting viewpoints are encouraged to attend. We hope that the evening will be filled with lively, friendly discussion among open-minded New Yorkers. NOTE: Please bring your favorite bottle of wine, nonalcoholic beverage, or finger foods to share. Otherwise, we recommend a small donation of $5-$10 to help cover costs. Our organization is in its infancy and we do not rely on membership dues or entrance fees. Your organizers will provide finger foods and appropriate cups/utensils." 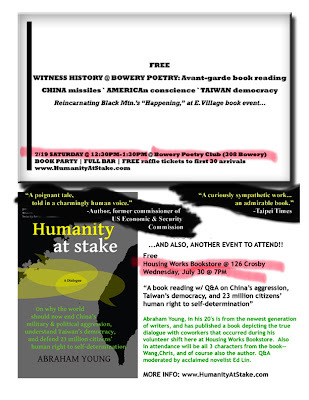 Book Party + "WITNESS HISTORY: Avant-garde book reading"
"A book reading w/ Q&A on China's aggression, Taiwan's democracy, and 23 million citizens' human right to self-determination"
Also in attendance will be all 3 characters from the book--Wang, the ethnic-Chinese college student in NYC, Chris, the American Airlines pilot who flew planes during the Gulf War, and of course, also the author. Q&A will be moderated by Ed Lin, author of Waylaid and This Is a Bust. Book discussion, "Advocate for Taiwan" weekend, Washington, D.C.